After years of advocating for more health care services, the Pinaymootang First Nations Health Centre offers regular doctors and a pharmacy for the community. 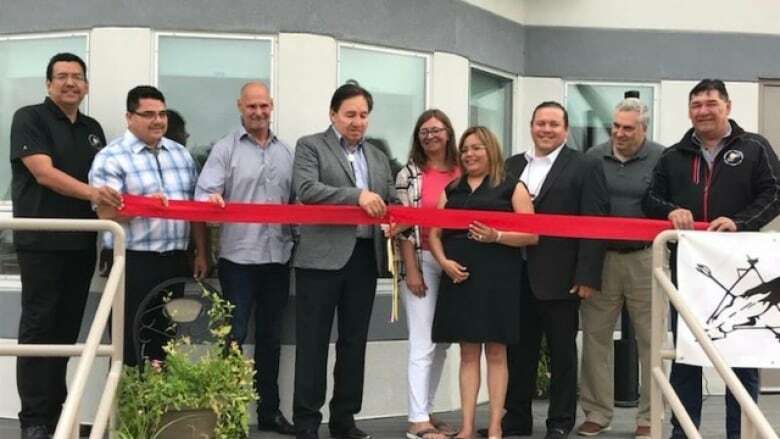 After years of advocating for more health care services, the Pinaymootang First Nation Health Centre opened its expanded facility on July 4, hoping its improved services will mean people in the community don't have to make the long trip to Winnipeg for care. The expanded facility will offer more health care services for the rural community, about 220 kilometres northwest of Winnipeg in Manitoba's Interlake, and other surrounding areas that were deeply affected by flooding in 2011. The new health centre has only been open for a week, but the nurses are already feeling the increased demand caused by offering more services, said health director Gwen Traverse. "We have people coming from rural communities nearby," she said. The new services include doctors coming to the community twice a week, a satellite pharmacy, women's clinics, better home and community care, immunization care, foot care and more access to mental health services, said Traverse. She said thanks to the new services being offered, many people from rural communities close to Pinaymootang are now heading there instead of driving to Winnipeg. The health centre is available to anyone who needs it. The expansion was made possible through different partnerships with both the Interlake-Eastern Regional Health Authority and LifeSmart Health — an independent health-care provider offering services to Winnipeg and the surrounding area. The partnership between LifeSmart and the Pinaymootang Health Centre is a pilot project, said Traverse, which has helped expand the centre's services. "We asked the community what they need and what they can use from us versus telling them what they need," said LifeSmart president Louis Chute. Chute contacted Traverse earlier this year, and they worked out the details to start the pilot project, which began by providing a physician one day a week, but has already expanded with the pharmacy. Chute plans to expand again soon to help the health centre offer specialty services, such as cardiac services and diabetes management. "We think that the community should be able to benefit from the services that we have here [in Winnipeg]," he said. "Rural health care just isn't like Winnipeg," said Traverse. The First Nation is still recovering from the 2011 flood, during which a number of First Nations in the region were flooded. Some people from those communities were displaced for years. An increase in mental health services has been needed since the flood, which damaged many homes, said Traverse. People are also returning to their homes and communities and the increased mental health services will help them deal with any issues that stem from the flood, she said. "I want to make sure there's continuity of care.… I want to become a hub centre where there can be service for our surrounding areas that were impacted by the flood," said Traverse. "You can come to Pinaymootang and all these services are there." The health centre offers training for its staff, hoping to provide any service that might be needed in the community. "Pinaymootang is an accredited health facility. We like to always train [and] make sure our staff is fully trained in different aspects," such as well women's clinics to ensure that women are receiving the specific health services they need.